When the High Brahmin tells the Rajah about Solor’s secret love, the Rajah decides that Nikiya, not Solor, should be killed. Princess Gamzatti is to be married to Solor. She overhears and tries to bribe Nikiya to give up Solor, but Nikiya refuses. The Rajah and Gamzatti arrange for Nikiya to be killed by a snake bite during the engagement festivities. Despondent, Solor is filled with remorse and haunted by visions of Nikiya. He cannot complete the wedding ceremony. The gods are angered and destroy the temple with all inside it. In the afterlife, Solor and Nikiya are finally united. 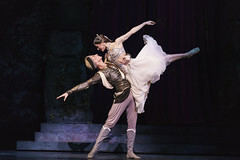 The Kingdom of the Shades scene in Act II is one of the ballet's highlights, in which a series of arabesques across the moonlit stage demonstrates the strength of the corps de ballet and the beauty of Marius Petipa's choreography. The ballet also contains roles of very different styles for two ballerinas in Nikiya and Gamzatti, a spectacular virtuoso solo for the Bronze Idol, and stunning pas de deux for Solor with both Nikiya and Gamzatti. To find out more visit the La Bayadère (2018) production page.